Inspired by the famous Napoleonic battle of Quatre Bras! 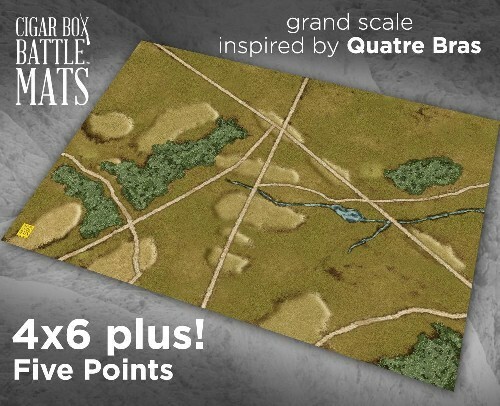 This is the mat we use for our grand-tactical Quatre Bras games, but we have kept this mat flexible enough to also be used for just about any generic or hypothetical battle in history (or fantasy) that involves a fight at a cross-roads! We have used this mat for the Seven Years War, American Civil War, Marlburian, Romans vs Celts, War of the Roses, WW2 (Bolt Action), Warmaster, etc. We recommend this mat for 6mm to 15mm figures. The road width is approximately 1 inch wide. Use the mat "as is" or add your own miniature buildings, hedges, and terrain to really bring it to life!